They say women gain weight after marriage. I wanted to defy “them.” I ate right. I ran. Then I went out to eat with friends a little more often. Then I ran a little less often. Now I am completely sedentary. And a doctor’s visit forced me to acknowledge my weight gain. Sigh. Sure, I noticed my clothes getting a little obscenely tight, but maybe time would work all that out? Today’s wakeup call: my husband had to help me latch the two little buckles on the waist of my pants. I yanked and pulled and groaned, but the little latches wouldn’t catch the buckles. They teased every time I got close. And now when I sit, I can feel the rolls on my waist gently nudging one another. 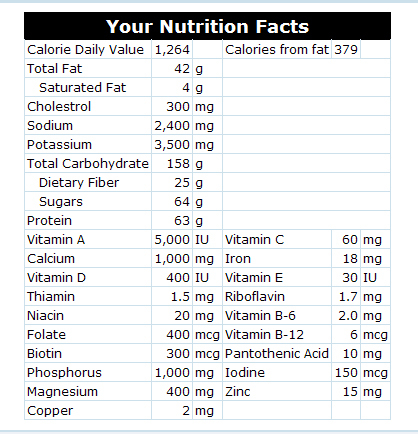 So I went to this Web site, Ask the Dietitian. I had to enter exactly how many hours I sleep, how many hours I’m sedentary, how many hours I’m slightly active, and how many hours I’m very active. This forced me to reflect and be very honest about recent weeks. I usually like to fib about these things…add a high activity here, take out a sedentary hour there. High activity for me might occur once or twice a week. But not daily and not for very long at that. So, based on this information, the site advised me on a daily regimen of calories and vitamins, with a goal of losing one pound per week. 1264 calories? That’s just one meal if I’m eating out. I’ve got some serious work to do. It’s time to get cardio going on a regular basis. I’ll keep you posted. In the meantime, here’s a tip from Jimmy: 7 meals under 300 calories! This entry was posted in Get Your Eat On, Healthy Schmealthy and tagged calories, embarrassing, exercise, health, nutrition. Bookmark the permalink. basically, that’s not a problem.. It is therefore very important to create a balance between exercise, rest and diet to stay healthy and fit. Exercising too much and eating too little will not do you any good so forget about reducing your food and fluid intake to reduce your body size and weight fast. You will get sick if you do that.